We bring design and business together by appreciating that a site must look good but that it also has to pay its way and contribute to that all important bottom line. First impressions count for a lot and your web site is no different. When people find you on the web they will make a judgement about you, based partly on the look and feel of your web site. So, it’s important to ensure that your site makes the right impression. If you pay attention to detail in your business and want your customers to know that, then it stands to reason that you should pay attention to detail when it’s comes to your web site. We’ve been designing and developing web sites for 10 years now and we understand that those sites have been good for our clients. A few of our recent web sites, plus one or two from the past are listed in our Portoflio to give you a taste of what we can do. If you like what you see then give us a call to discuss how Active Image Web Solutions can help you. Web sites can now be designed and developed using various strategies and methodologies. 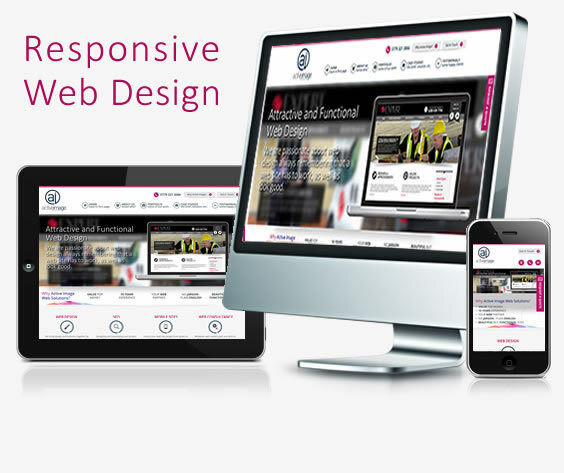 These include Responsive, Fluid, Fixed and Adaptive design. They can have a bespoke CMS associated with them or they can use standard CMS and development environments such as WordPress or JOOMLA. If you would like your site designed and developed using specific tools then by all means let us know. However, most of our clients leave that decision to us trusting that we will ensure we use the rights tools for the job.